After no one scored in overtime, Carter Maack netted the tourney-winning goal for the Raiders in the fourth round of a shootout. After three periods of hockey, the Schwan's Cup Silver Division championship contest between Hudson and St. Michael-Albertville was tied 3-3. After eight minutes of overtime, the score did not budge. And then it took four rounds of a shootout — including seven straight misses — to finally determine a tournament winner. Carter Maack's goal in the fourth round of the shootout gave Hudson the tourney hardware over St. Michael-Albertville at Ridder Arena on the campus of the University of Minnesota in Minneapolis Tuesday night. Raiders goalie AJ Cohen came up with four consecutive shootout saves to preserve the win. "As the guy would come down [the ice], I tried to be aggressive but still wait for him to make the first move," said Cohen, who finished with 31 saves in regulation. "After making the first save, it gives you confidence — and it makes the shooters on the other team nervous." The Raiders' first three shootout attempts also failed to click, putting the pressure on Maack to end the contest. "I knew I had to do something to make it happen," he said. "In a shootout, I usually go down the left side, fake a shot, then go backhand to forehand — and put it in the net." That's exactly what Maack did, beating Knights goalie Blake Marhula to give the Raiders their second consecutive Schwan's Cup title and move their season record to 6-3-1. Last season Hudson, the two-time defending state champ in Wisconsin, won the championship in the Bronze division. "We're always trying to improve our schedule," Raiders coach Brooks Lockwood said. "As a Wisconsin team, you always want to come over the river and play the best competition possible." Meanwhile, the Knights lost a shootout in the Schwan's Cup for the third time. "And two of those [shootout losses] came in the championship [round]," St. Michael-Albertville coach Jerremiah Johnson said. "I was thinking maybe today would be the day we would break that streak." The last time the Knights lost a Schwan’s Cup shootout was during the 2016-17 season, when they fell to Breck in that tourney’s Silver Division finale. Tuesday’s match ended with a thrilling finish in which Hudson took three one-goal leads, only to see the Knights tie the game each time. The Raiders' Sam Ross scored the only goal of the opening period, finding the back of the net with a power-play marker with 2 minutes, 14 seconds remaining. Adam Flammang tied the game for St. Michael-Albertville at the 5:11 mark of the second period, but Hudson retook the lead on Cole Danielson's goal off a rebound at 8:33. Flammang tied it again at 12:24, firing a rebound past Cohen for his second goal of the game. "They have two kids who can fly [in Flammang and Swenson]," Lockwood said. "We allowed them to do a lot in the neutral zone, and that didn't help us." But a nifty wrister by Payton Hanson with just 1 minute, 33 seconds left gave the Raiders a 3-2 lead through two periods. 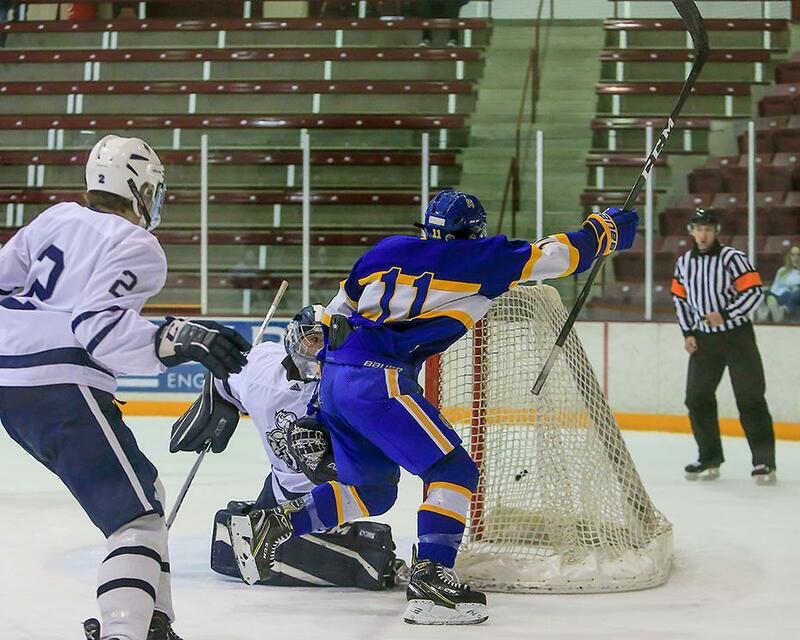 In the third period, St. Michael-Albertville again tied the game when Nick LaMere scored at 7:50. The game remained tied despite a wide-open overtime session that saw a number of odd-man rushes and several dazzling saves by both Cohen and Marhula, who stopped 29 shots. That set the stage for the heroics of Cohen and Maack. "It's great to come to this tournament and represent Wisconsin," Cohen said. "Playing in a tournament with all Minnesota teams, our opponents like to doubt us and say we're not as good. So we like to show them different." With what’s technically a tie, St. Michael-Albertville, which advanced to the Class 2A state tournament last season, sits at 7-3-1 this season. "That's a good team over there, and I thought we played them pretty evenly," Johnson said. "We graduated 13 seniors from our state tournament team, and we basically had four guys returning, so we are young. "I thought it was too bad one team had to go home as the loser in a shootout." After finishing overtime tied 3-3, Hudson's Carter Maack scored in the fourth round of a shootout to give the Raiders the tourney crown over St. Michael-Albertville in the Schwan's Cup Silver Division championship at Ridder Arena in Minneapolis Tuesday night. Hudson, the two-time defending state champion in Wisconsin, moved to 6-3-1 on the season and won its second straight tournament crown after claiming the Bronze division title at last year’s Schwan’s Cup. 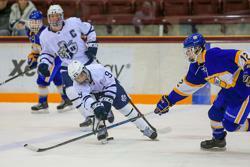 Sam Ross, Cole Danielson and Payton Hanson scored for the Raiders in regulation. Adam Flammang scored a pair of goals for St. Michael-Albertville (7-3-1, 4-1-0). Teammate Nick LaMere contributed with a third-period tally. 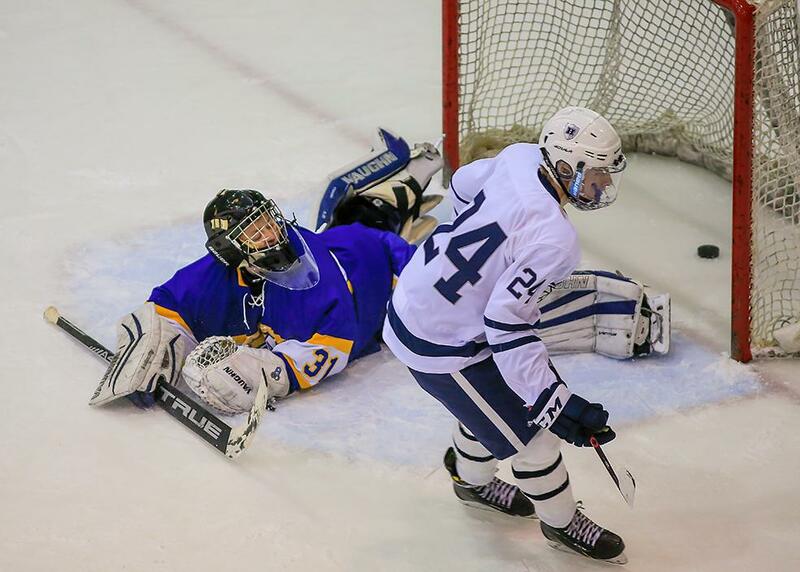 AJ Cohen finished with 31 saves in regulation for Hudson; he also stopped all four shots he faced in the shootout. 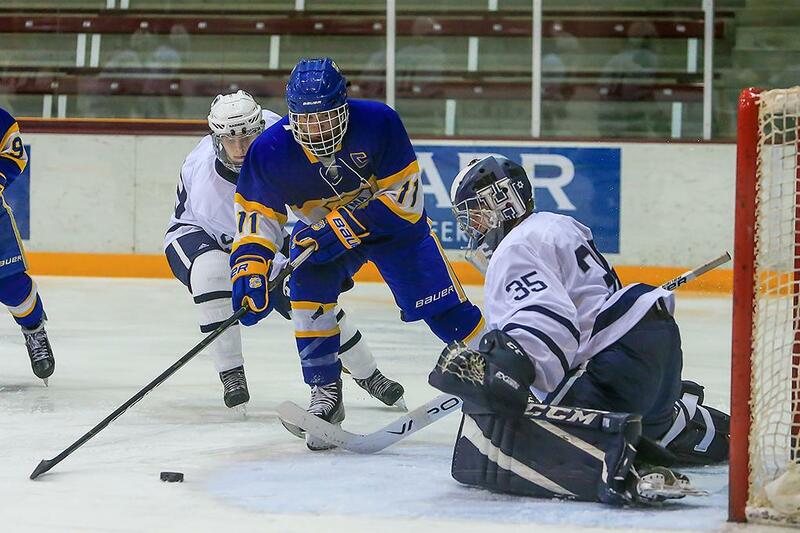 Blake Marhula finished with 29 saves in regulation for St. Michael-Albertville.